A report by Post Office Travel Money has concluded that Sri Lanka holidays offer the best value for UK travellers out of all long-haul destinations. Thailand holidays have often been praised for offering the best value, but in the latest Post office survey Thailand has nose-dived to sixth place as Sri Lanka has headed the list of rival countries anxious to attract UK tourists. 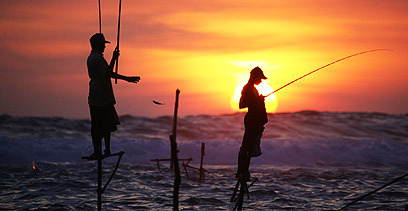 The Post Office said that since the end of the war the number of British travellers taking cheap flights to Sri Lanka was “already on a high”, with UK arrivals up 51 per cent year-on-year – and the trend was only likely to increase over the next few months. The next countries named for long-haul value were Mexico and Kenya respectively, followed by Malaysia and Indonesia. The Post Office Travel Money report compiled the list using criteria such as the price of meals, drinks, suncream and gifts. The head of the Travel Money division, Sarah Munro, said the good variety of cheap hotels and low-cost resorts, as well as a burgeoning boutique market to rival any in Asia, was a welcome development among many long-haul destinations. “The information we have collected shows that Sri Lanka and Mexico offer excellent value for money,” she said. The Sri Lanka Travel Blog could have told the Post office that years ago. But it is nice that people are catching on. An impressive share! I’ve just forwarded this onto a colleague who had been doing a little homework on this. And he actually ordered me breakfast due to the fact that I found it for him… lol. So let me reword this…. Thank YOU for the meal!! But yeah, thanks for spending some time to talk about this subject here on your blog. Woah! I’m really enjoying the template/theme of this website. It’s simple, yet effective. A lot of times it’s very difficult to get that “perfect balance” between user friendliness and visual appeal. I must say you’ve done a amazing job with this. Also, the blog loads super quick for me on Opera. Superb Blog! Simply wish to say your article is as astonishing. The clarity in your publish is just great and that i could think you’re a professional on this subject. Well together with your permission allow me to seize your feed to keep up to date with forthcoming post. Thanks a million and please carry on the gratifying work. I tend not to drop a lot of remarks, however i did some searching and wound up here %BLOG_TITLE%. And I do have some questions for you if it’s allright. Could it be just me or does it give the impression like some of the responses appear like left by brain dead visitors? 😛 And, if you are writing on other online sites, I would lie to follow everything fresh you have to post. Could you make a list of all of your community pages like your twitter feed, Facebook page or linkedin profile? Howdy! Quick question that’s entirely off topic. Do you know how to make your site mobile friendly? My web site looks weird when viewing from my iphone. I’m trying to find a template or plugin that might be able to resolve this issue. If you have any suggestions, please share. Many thanks! This post presents clear idea designed for the new visitors of blogging, that genuinely how to do blogging and site-building. I will immediately seize your rss as I can’t to find your e-mail subscription hyperlink or newsletter service. Do you’ve any? Kindly permit me understand in order that I may subscribe. Thanks.